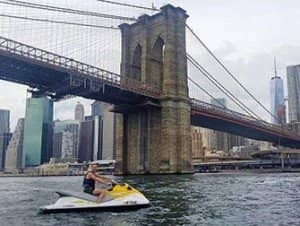 Jet skiing in New York is an activity for adrenaline junkies who like to literally see New York from a different perspective. 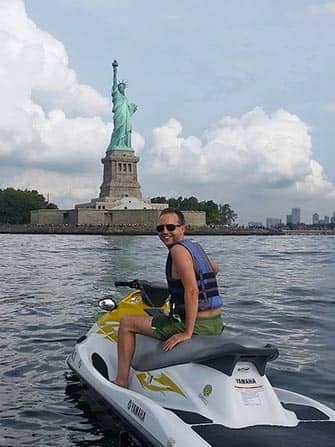 Tour the city’s highlights on a jet ski, from the Statue of Liberty to Coney Island and from Staten Island to the One World Trade Center. You also cruise the Hudson River, East River and under all famous bridges such as the Brooklyn Bridge and the Manhattan Bridge. With a speed of up to 88 km/h, you easily over take all the sightseeing cruises and have an unforgettable day on the water. The tour begins at Rockaway Beach, Queens. This part of New York has a nice ‘surf beach’ atmosphere. You can get there in about an hour and fifteen minutes with the A-train from Manhattan, for the last bit you change to the shuttle subway. The subway is easy to find and the rental place is just a few minutes walk from the subway station. When you arrive at the rental place you can change clothes, there are lockers for your belongings. There are showers to use afterwards. You get a life jacket and you can choose to wear a wetsuit. I haven’t done this personally, but if it’s colder than 25 degrees Celsius I would recommend you to do so. Don’t forget your sunscreen. Before you can sprint off on your jet ski you first get an explanation about the do’s and dont’s on the water. You can’t freestyle for example, but gearing up is definitely is not a problem! Eric’s Tip 1: The jet ski does have a storage compartment, but everything that is in there could get wet. It’s perfect for a bottle of water, but don’t take a regular camera. The guide will have a camera with him and will take photos of you along the way without extra costs. 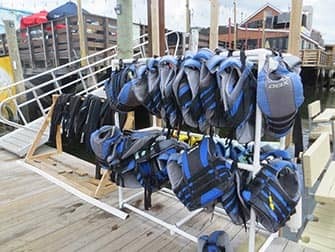 Take the bathing suit you would like to wear on the jet ski and some dry clothes and a towel to use after the tour. You can wear sunglasses, but keep in mind they might fall off due to the speed. You then set off accompanied by a guide and will be on the water for four hours. You jetski all around Brooklyn back to Manhattan, past Staten Island towards the Statue of Liberty. Be careful not to splash Lady Liberty when you hit the pedal in the direction of the Hudson, you will see New York’s skyline as not many others have seen it. You ski back to the East River, whilst your guide takes the best photo ever of you in front of the One World Trade Center or under the Brooklyn Bridge. Don’t expect a quiet ride, you can get up to speeds of 90 km/h! How far you will get depends on the speed of your group. I personally was as fast as lightning, but if you take it a bit slower you will cover a shorter distance. On this tour I did 112 kilometres on my jetski! 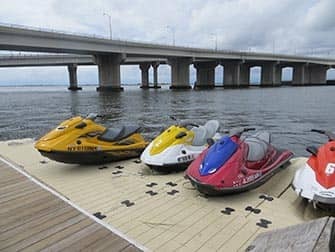 After a few hours full of action on the Jet skiing in New York – Jet Skis, you will head back to Rockaway Beach tired but satisfied. Upon arrival you can head back to Manhattan straight away of course, but there is a beach as well. So you could also take your towel and have a day at the beach or eat at one of the restaurants! Eric’s Tip 2: If you go with the two of you, it’s a good idea to get one jet ski to share. You’re on the water for quite some time and if you’re steering the jet ski for the whole period it is quite intense. I even got cramps in my hands. If you’re with the two of you, you can switch and it saves you almost 50% of the price! Extra: Please note that the departure point of the tour might be a bit hard to find. It’s next to the Asian restaurant, just look for the jetski’s in the water!